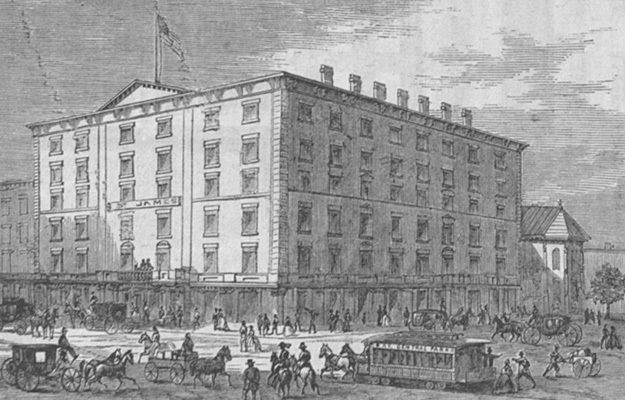 On the night, November 25, 1864, a hotel guest calling himself John School set the bed linens ablaze in a room of the St. James Hotel at 26th and Broadway (pictured above). It was 8:43 PM, and this was to be only the first of over 20 blazes to break out that night. The fires, set in rapid succession by terrorists across the city mostly along Broadway, included another in NoMad at The Fifth Avenue Hotel, just two blocks down from the St. James at 23rd/24th and Broadway. The attacks were part of a Confederate plot. Originally planned to coincide with Election Day November 8th, they were intended to disrupt the re-election of Lincoln by completely destroying the city and sending panic through the civilian population. With the Confederacy badly losing the war, it was thought that the destruction of a major Union city would cause the Copperheads (anti-Lincoln Democrats) to rise, elect a president sympathetic to peace, and end the war in the Confederacy’s favor. Fortunately, the plot was aborted by good Union intelligence and bad Confederate planning. Eight Confederate secret service conspirators organized in Canada traveled to New York to execute the plan, but arriving in the City, they got a surprise. The Lincoln administration had received intelligence about the plot and four days before Election Day sent 3,500 Union troops into the city. Supporting Copperheads, who Confederates thought to be 20,000 strong in the City, failed to materialize in face of the huge troop presence. So, the saboteurs didn’t act on Election Day, and Lincoln was given a second term. Frustrated and humiliated by Confederate defeats, the destruction of the Shenandoah Valley and the taking of Atlanta, they decided to retaliate anyway and attacked on November 25th. For reasons that may never be known, New York officials and papers would not give credence to the threats (surfacing since early October) and resisted federal official warnings until the very afternoon of November 25th when civil authorities finally accepted the situation and took immediate steps to thwart the plans of the conspirators. Plain-clothes men, policemen and soldiers by the hundreds were quickly distributed about the city, particularly to the hotels that had been specially named by the Union spy as intended starting-points for the conflagration. 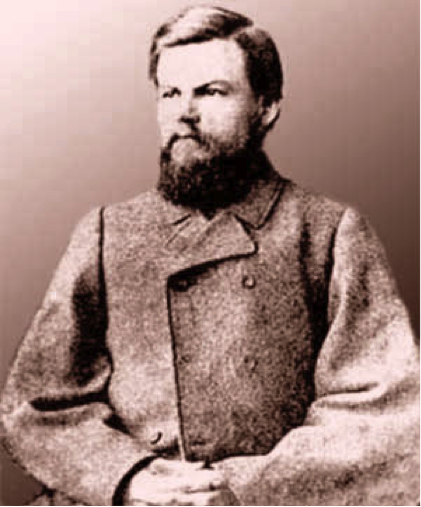 That night, Confederate Lieutenant Colonel Robert Martin met with his terrorists. 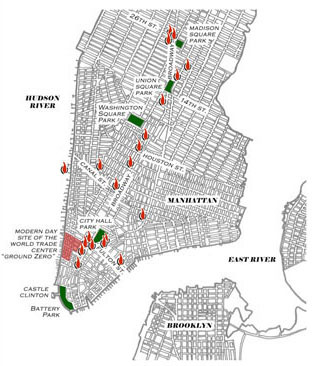 They were ordered to set 19 hotels ablaze at about 8:00 PM, including the Astor, United States, Fifth Avenue, Everett, St. Nicholas, Lafarge, Howard, Hanford, Belmont, New England, St. James, Tammany and Metropolitan (see map below). In addition to the fires at the hotels, there was also an alarm reported at Barnum’s Museum and two hay barges in the North River at the foot of Beach Street were also set on fire. November 25th was to be a day of celebration as it had been for 80 years. It was Evacuation Day — the day that the British abandoned New York during the Revolutionary War. Among the celebrations was one at the Winter Garden Theatre at 624 Broadway (across from Bond Street just south of West Third Street). The Booth brothers were performing together for the first time. Putting aside their divergent political views, Edwin, Junius, and John Wilkes, joined together in performance to raise money for the bronze statue of Shakespeare that still stands on the mall in Central Park. However, near panic broke out in the theatre when the Lafarge Hotel next door was set afire by the conspirators at about 9:20 PM. Only the swift thinking and calming words of Edwin Booth prevented the audience from stampeding. In fact, all in all, little damage was done to the property or the spirit of the city. The conspirators struck at the wrong time. The city was awake, fire volunteers were ready, officials were on high alert, and there was virtually no wind. Moreover, the terrorists failed to open the windows of the hotel, and the incendiary they used, Greek Fire (an ancient concoction of sulfur, naphtha and quicklime that burst into flames when exposed to air), needs oxygen to effectively ignite. While the fires caused some panic, they were shortly put out and only slight damage was done to some hotel rooms. Had the conspirators struck in the right way and at the right time on busy Broadway, the crowded “Main Street” of the City, or hit the Manhattan Gas Works, things might have been very different. Fires had destroyed most of New York before. If only a fraction of the huge number set that night had caught hold, the fire department would have been overwhelmed and the plan to destroy the city below 26th Street would have succeeded. Indeed, the course of the entire Civil War might well have changed. Only one of the Confederate terrorists was ever apprehended. Captain Robert C. Kennedy of the Confederate army (pictured above) escaped to Canada two days after the fires along with his co-conspirators and returned several times to the U.S. to carry out plots. He was finally caught and returned to New York for trial. Kennedy was hanged on March 25, 1865 at Fort Lafayette, which once stood where the Brooklyn pylon of the Verrazano Bridge now stands. He was the last Confederate solider executed by the Union. The original New York Times article on November 26, 1864 reporting the fires can be found here.